In 2060 Aboriginal rock art in Australia might have all but disappeared. Pollution, development, bureaucrats, vandals and animals all play a role. During their spiritual cycle Aboriginal people periodically re-grooved their rock engravings which ensured that they survived the thousands of years this rock art is known to be old. Today re-grooving is very rare since in many cases the traditional owners of the rock engravings have passed away and no-one has the authority to renew them. As a consequence Aboriginal rock art is exposed to environmental pollution. The groove depth decreased over the last decades, an effect which is accelerated by the increasing number of cars in Australia. While early explorers in the 1880s measured Indigenous rock engravings to be around one inch (25.4 mm) deep, this figure dropped to 16mm in the 1950s, 8 to 10mm in the 1990s and around 5mm in 2008 . 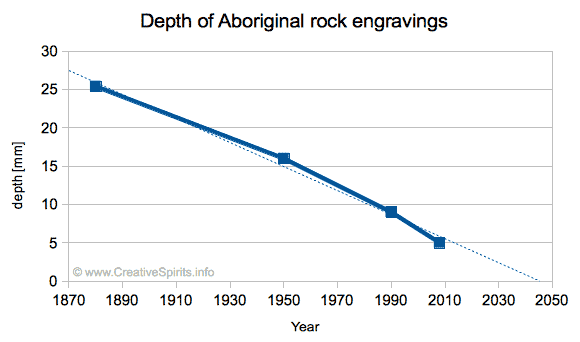 Aboriginal rock engravings lose about half a grain of rock per year. Even if an engraving is not directly exposed to rain, dew and fog settles on the rock and dissolves the 'glue' that holds together the grains. While in traditional times it was customary to repair and renew art work, National Parks today don't allow Aboriginal people to do this, even though there are many people who could do the work . Changes in the micro climate around rock art can affect them as well. "Even small changes in carbon dioxide levels, temperature and humidity can influence the growth of micro organism and algae and cause irreparable damage," says Robert Bednarik, founder of the Australian Rock Art Research Association . In a few decades you will not be able to point out rock engravings you can still see today. In fact, whole figures and even whole panels of art have already completely disappeared . Aboriginal rock engravings get shallower and shallower. When your children try to show them to their kids hardly anything will be left. Some non-Indigenous people tried to preserve Aboriginal rock art in painting the grooves with white paint (see image below). This act compares to desecration because rock engravings usually mark spiritual sites of great significance to Aboriginal people. When an engraving near Bondi Beach in Sydney was re-grooved in 1967 the Aboriginal community was divided as to whether this was a rightful act or not. 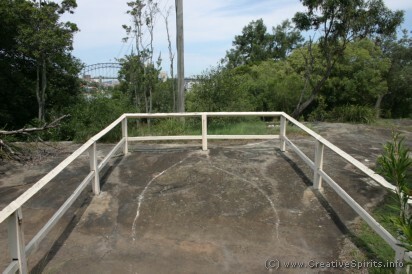 Grooves of an Aboriginal rock engraving painted in white. This is a weak and disrespectful act by non-Indigenous people trying to make visible and preserve an urban Aboriginal rock engraving. Rock engravings and Wandjina art used to be regularly re-grooved, repainted and restored, but it's a practice that is dying out. The thick ochres, especially the white pigment used in Wandjina paintings, sit on the surface of the rock and will eventually fade and crumble away. So, unlike the long-surviving Gwions, where the red pigment used permeates the rock, many Wandjinas are likely to disappear, leaving little trace . Aboriginal sites are allowed to be 'disturbed' or destroyed by state governments. Between 2005 and 2009 the NSW government approved 541 permits to destroy or disturb Aboriginal heritage sites . Not a single application to do so was rejected in the first 10 months of 2008. Between June 2012 and June 2013, the NSW Office of the Environment and Heritage – the organisation supposed to protect Aboriginal heritage – considered 99 applications to destroy Aboriginal heritage and culture and approved all of them . The Office claims, however, that only half of the applications reach this final step . When the National Parks and Wildlife Act was enacted in 2001, last-minute lobbying by mining and agriculture interests prevented amendments that would have created a stricter protection regime for Aboriginal sites . In 2009 a Tasmanian road project worth 164 million Australian dollars threatened to destroy "thousands of stone tools, quarry sites and campsites" and possibly several burial sites . Work began before community consultations were completed. During construction of Sydney's light rail to the eastern suburbs workers unearthed a large site with Aboriginal artefacts. Rather than protect this historic site, both state and federal governments rejected to pause development works. Which other country would do that? Development is just one of many threats to Aboriginal land and its art. When companies 'develop' areas they might unintentionally or knowingly destroy destroy Aboriginal rock art. You rarely read about such cases in the press, so the following story is worth mentioning. The Burrup Peninsula near Karratha in Western Australia holds what some believe is the largest and oldest open air rock art site in the world. Traditional owners accused cement company Cemex (later trading as Holcim) of having destroyed a 10,000-year-old quarry and two other sites  while carrying out rock blasting at Nickol Bay quarry in December 2008. The damage to the sites has been found to be "significant" enough to warrant legal proceedings , but despite the possibility for a court case the company was only fined $280,000 by the federal government in February 2010, and obliged to pay an undisclosed sum of money to Aboriginal communities. When Aboriginal art is found where companies operate, some claim it to be "questionable" or a "replica"--until proven wrong . Time is not the only danger Aboriginal to rock art. Crude graffiti scratched into rocks bearing thousand-year-old images, vandals chiselling away the rock, construction camps built near sacred sites  and tourists (and locals) treading on rock art sites contribute to the decay of sites of priceless Aboriginal history. When Rachel Perkins scouted locations for her extraordinary series First Australians she had to abandon Bull Cave due to graffiti. 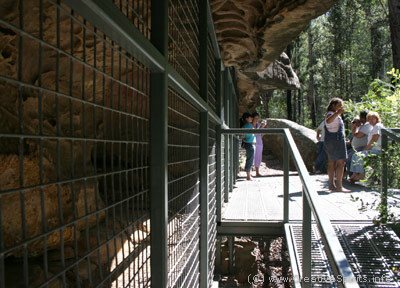 Other sites damaged by vandals include Red Hand Cave in the Blue Mountains (which now has been completely covered by perspex and bars), Bunjil Cave in Garriwerd, the Grampians (now protected by a metal cage), rock art at Mutitjulu waterhole at Uluru (Ayers Rock), Blackfellows Hands Reserve near Lithgow (NSW) and rock engravings in Darkinjung National Park which were destroyed by someone unloading wet cement onto it . On the Burrup Peninsula in Western Australia Aboriginal elders recorded 15 to 20 sites with "significant" graffiti damage . 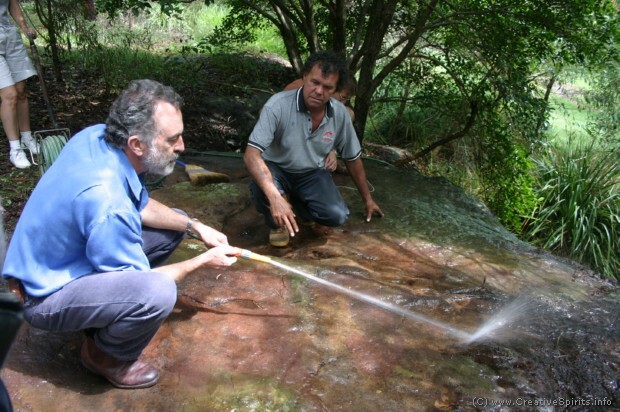 Damaging heritage rock art can be punished by fines up to $110,000 or two years' imprisonment. Red Hand Cave, Blue Mountains, NSW. After vandals repeatedly attacked the hand stencils of this cave it was closed with a metal lattice. 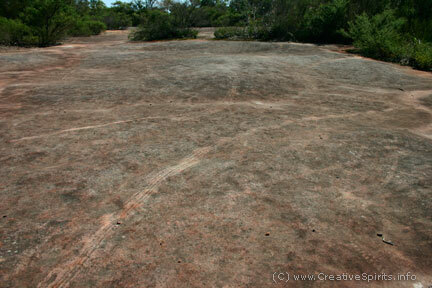 Skid marks on an Aboriginal rock art site. The long bright streaks are skid marks left behind by vandals riding their bikes over Aboriginal rock art. Found at a site in Sydney. 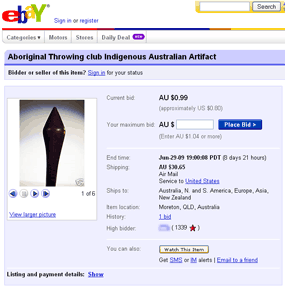 Aboriginal artefacts are auctioned on eBay. No-one knows if they have been illegally stolen from an unprotected rock art site. Theft is another problem. In a particularly bad example, vandals removed at least one rock face with power tools from the Burrup Peninsula, Australia's largest and oldest rock art site . The Koori Mail reported in April 2009 about reports that Aboriginal artefacts were sold on eBay . It is no wonder that some Aboriginal rock art sites are no longer listed or signposted. Australia needs to hide its most ancient art from its own people. In 2009 if you had damaged Aboriginal rock art you could have gone away with it if you "didn't know or didn't intend to damage or remove Aboriginal artefacts or heritage sites" . 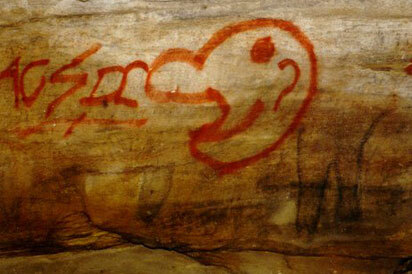 But this was only possible because legislation intended to protect rock art still hadn't been put in place. In 2001 the NSW government moved to amend the National Parks and Wildlife Act to make it an offence to disturb Aboriginal artefacts or sites. The law wasn't enacted due to "certain lobby groups" intervening (which most probably were miners or pastoralists). Eventually the National Parks and Wildlife Amendment Bill 2010 passed through the NSW government. Now offenders cannot claim lack of intent anymore and a person or company is liable for the damages caused. A 2011 State of the Environment report found Aboriginal heritage was neither well protected nor well recorded . And it won't get better. Aboriginal rock art which covers lower areas is prone to feral animals destroying it. Wild buffalo in the Northern Territory rub their bodies against rocks to get rid of parasites, destroying Aboriginal art.